Ms. Link is currently serving as the Clinical Coordinator for the Associate of Science in Radiography program at Aultman College. Her responsibilities include instructing several RAD courses, coordination of the student clinical component, and program assessment. In addition she serves as a Quality Matters Peer Course Reviewer and as an adjunct for the general education division. She applied for a clinical instructor position in the previous Radiologic Technology certificate program in 2008 because she valued the long, rich history that Aultman had in the community for educating health care workers. In 2011, the radiography program transitioned to the Associate of Science in Radiography program, which was an educational process that helped her grow both personally and professionally. 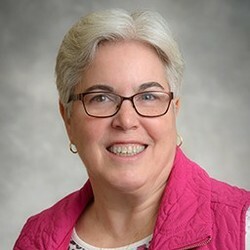 She completed a Master in Adult Health Education from Saint Joseph’s College of Maine in 2014 because she recognized the importance of her role as an instructor to adapt her teaching style to meet the learning needs of her students. Two of her personal values are professionalism and life-long learning regardless of the length of time that a person has been working in the field. She encourages her students and graduates to pursue their dreams by completing higher education and continuing to grow professionally when presented with the opportunity whether it be professional membership or a job advancement. Ms. Link is a firm believer in giving back to the community through teamwork and volunteerism. She serves as a volunteer for Aultman College, The Loving Heart Foundation, and LifeWay Church in New Philadelphia as well as teaches life skills to a group of 5th and 6th grade girls called the B.L.I.N.G. Girls. In her spare time, Ms. Link enjoys spending time with her husband and many nieces and nephews, reading, and biking.